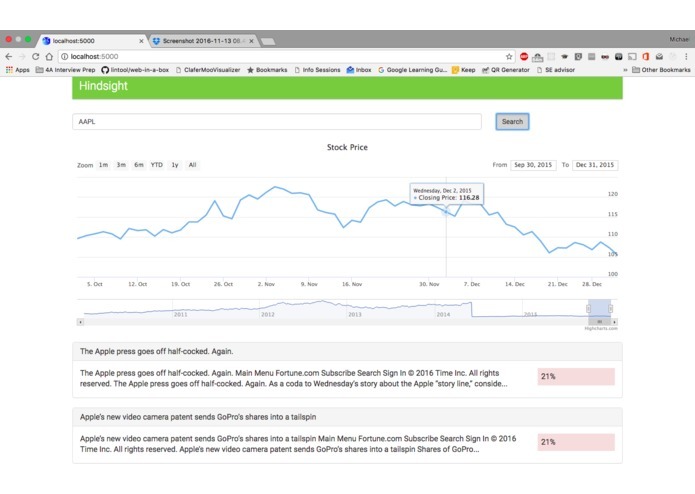 Hindsight is a web app that helps people to look for correlations between stock prices and sentiments. Advances in natural language processing techniques and the rise of web 2.0 made sentiment analysis a popular area of study. We want to look at how sentiment analysis can be applied to trading stocks to bring automated and timely information to casual traders. Hindsight allows users to look at the sentiments of news articles related to a company during a certain date interval and how it changes over time. Users can see if there is some correlation between the sentiment of how others write about the company with the value of its stock. We used the NASDAQ API provided for Cal Hacks 3.0 to obtain historical stock prices for companies we are interested in. Since the API is rate-limited and can be slow, we parsed the XML data obtained from the API in Python and stored them to a postgresql database. To obtain historical news articles, we had to use web scraping to obtain links related to the companies were are interested in from Google News, including ones from years ago in the past. We used tools such as selenium and beautifulsoup to deal with this. We then store the text from these pages in ElasticSearch to take advantage of its full-text search capabilities. To obtain sentiment scores, we utilized the Microsoft Cognitive Services Text Analytics API. Users use our service through a single page web application served by Flask, using modern frameworks including React, Redux, and Immutable.js. We had significant trouble getting the historical news articles. At first we used the Event Registry service, but we found it had low relevance for some companies (e.g. a one-word mention of Apple in a non Apple-related article was believed to be related to Apple). We decided to use Google News since we can browse historical new articles on the website and it is also highly relevant. However, Google shutted down its News API so scraping a small subset of content was the choice left to us. We built a working web app that touches a broad spectrum of technologies in less than 2 days. The problem is quite challenging and involves wrangling lots of data, dealing with heavy rate limitation, and work with many unfamiliar frameworks. We learned to use the Redux framework in conjunction with React and learned about the capabilities of Microsoft Cognitive Services. We started working on streaming tweets related to particular companies using Kafka. We want to explore using something like Twitter that updates frequently to provide possible signals for how the market is doing currently and in the near future. 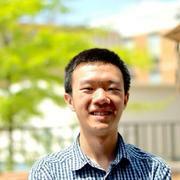 I worked on the ETL for getting stock price data from NASDAQ and getting news articles from Google News. I also worked on building the front-end. I architected the overall architecture and came up with most of the idea. I worked on getting the backend setup, standing up the postgres Azure instances, exposing public IPs, etc. I was also working on part of an addtional feature to stream realtime tweets through the cognitive services API to see how people felt about a company, unfortunately this part ran into various rate-limiting issues, and was unfinished. I worked on backend Microsoft Text Analytics API and EventRegistry API integration. This helped us get sentiment level for articles related to each stock that user searched.